Choose a pumpkin large enough to hold a large can inside. Clean out the pumpkin and carve a friendly or a frightening face. Keep in mind, carbon dioxide fog sinks so more fog will flow out of the bottom. When you are done cleaning out and carving your pumpkin, fill a large glass about half full with hot water and mix in a cup of salt. Use a glass that is taller than the eyes of your pumpkin in order to get fog to flow through all of the carvings. Place the glass inside of the pumpkin. 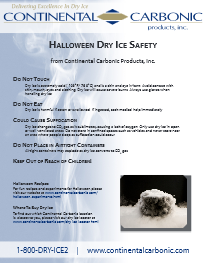 Wearing thick gloves, drop two or three large pieces of dry ice into the cup of water and cover the top of your pumpkin. Make sure the lid fits tightly to eliminate air currents dissipating the fog. As the water cools, add more hot water to maintain the fog effect. As a rule of thumb, one pound of dry ice will create 2-3 minutes of fog effect. The hotter the water, the more fog, but the quicker dissipation of the dry ice.